Producing materials by chemical vapor deposition (CVD) has become an important means of synthesis, in which high-energy molecular and atomic species generate a kinetically stable phase trapped in local energy minimum. Single crystal, polycrystalline, and nanocrystalline diamond now can be produced by microwave plasma assisted CVD (MPCVD). Typically, the MPCVD technique uses a low-pressure gas environment (e.g., < 200 Torr). Higher pressures result in higher growth rates, but growing the crystals at those conditions -- including even atmospheric pressure -- has been a technical challenge. Now, new work by Kadek Hemawan and co-workers at Carnegie has resulted in a method for synthesizing diamond at atmospheric pressure with a microwave capillary technique. In this technique, the plasma is produced inside a millimeter-sized quartz capillary tube, which generates a “microplasma” at ambient conditions. 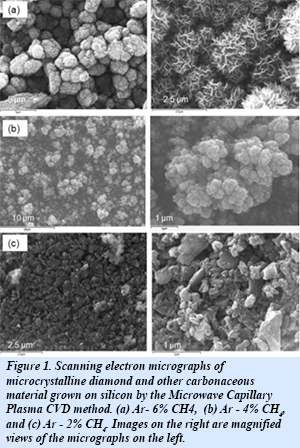 The synthesis of diamond on a silicon substrate by microwave plasma chemical vapor deposition was achieved at atmospheric pressure using a gaseous mixture of argon and a small amount of methane. Optical emission spectroscopy studies of the plasma during the growth process showed that Hα and Hβ, attributed to the dissociation of CH4 into carbon and hydrogen, were electronically excited, which is the reason it was not necessary to add hydrogen separately into the gas mixture feedstock. Increasing the pressure of the plasma during deposition enhances reaction rates and leads to more efficient energy exchange between the electronically excited “hot” species (electrons and ions) and the neutral atoms or molecules, as a result of the increased frequency of gas-phase collisions [K. Hemawan et al., Appl. Phys. Lett. 107, 181901 (2015)].